Checking for tooth decay is just one part of a thorough dental examination. the importance of daily oral hygiene care at home and between visits. Tooth Sensitivity ... also known as dentin hypersensitivity ... can affect a tooth or the exposed root surfaces of a tooth or teeth. This occurs when the enamel that protects our teeth continues to get thinner and thinner, or when there is a case of gum recession that often times exposes areas like the: the underlying surface or the dentin, which in turn reduces the protection the enamel and gums provide to the tooth and root. Statistics show that tooth sensitivity affects up to 57% of the population. If you are suffering from any of these symptoms you might be asking what can I do ? Well, proper oral hygiene is the key to preventing gums from receding and causing sensitive-tooth pain. If you brush your teeth incorrectly, or tend to over-brush your teeth your gums may become sensitive. If you are concerned that you might be experiencing some of these problems, please call our office at 941-488-1459 to setup an exam an a cleaning appointment with our highly skilled dental hygienist. Both our doctor and hygienist are more than qualified to also answer any questions you might have. A full set of permanent dentures is not necessary in many cases. A dental bridge is used to fill the gap created by one or more missing teeth. 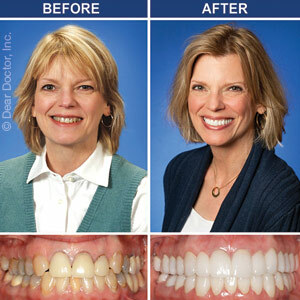 Another option is removable partial dentures for replacing missing teeth. There are many reasons to keep in mind when opting for removable partial dentures. Not only can partial dentures improve your appearance, but they can also improve your oral health by keeping what remaining teeth you have in place. If you opt for a dental bridge, your dentist will fit customized crowns to the teeth on either side of the gap that will need to be bridged. A false tooth (or in some cases teeth) called a pontic is attached to the crowns and replaces your missing tooth and or teeth. Traditional: Which involves placing crowns on the teeth that border the missing teeth. Cantilever: This is a type of bridge used if you only have teeth on one side of the missing tooth or teeth. Maryland Bonded: This is a type of bridge that consists of a porcelain tooth (or teeth) in a metal framework, with wings to attach this style bridge to existing teeth. In order to get the maximum benefit from a dental bridge it is important to keep the surrounding, supporting teeth healthy, therefore, be sure to follow a consistent oral care routine of twice a day tooth brushing and daily flossing. If you put this into practice and continue to practice good oral hygiene, and also see a dentist regularly, partial dentures can actually last anywhere from 5 to 15 years. Feel free to contact Malwin & Malwin Family Dentistry if you have any additional questions or concerns regarding dentures.